Works with Alexa The meshare security camera works with Amazon Alexa/Echo Show/Fire TV/Google Assistant. Just ask Alexa by a simple voice command to show the live video anywhere else you have your meShare Cam. (Alexa device sold separately). Free 6-month Cloud Service Get a free 6-month, 7-day, premium cloud service plan with Bank-level security. The cloud service features 24/7 intelligent recording with no storage limit, smart motion alerts, flashback, Video editing tools, you can customize, share or download footage at any time. Intelligent Alerts Night vision lets you detect what's happening around the clock, the camera reduces false alerts by using optimized algorithms, you will receive an alert and a short video clip when cameras see activity both day and night , check in anytime or watch motion clips on your mobile app. 2-year Warranty meShare offers a 30-day return policy and a 2-year limited warranty. Need help? Talk to a meShare technician with the Live Chat feature on the meShare app or contact us seller via amazon email buyer-seller-message. This powerful 5-in-1 DVR system offers an ideal solution for your home and business surveillance. Built with the advanced H.264+ coding standard, it enables you to save up to 75% more disk storage space than the ordinary H.264. Because of its strong compatibility, you can add 2pcs more IP cameras in addition to the 8pcs analog cameras. With its outstanding functions, video surveillance is a total breeze. 8+2 Channel 1080P Lite 5-in-1 DVR This robust DVR supports CVI/CVBS/AHD/TVI and IP cameras. 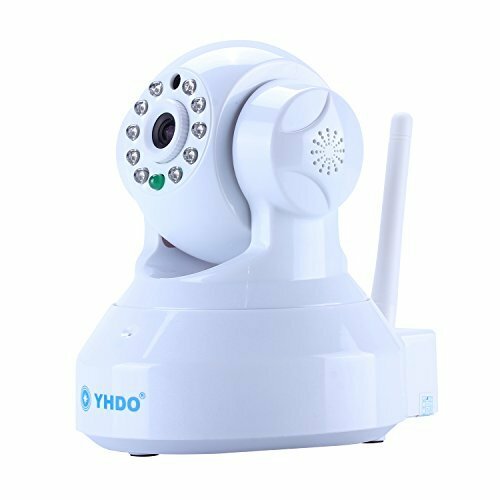 In addition to 8pcs analog cameras, you can add 2pcs more IP cameras to make the most of this powerful security system. Exceptional H.264+ Video Compression H.264+ considerably improves compression and transmission efficiency, without sacrificing video quality. It allows you to maximize storage space and enjoy ultra-long recording, 4x longer than H.264. Live View from Anywhere Anytime With the free ANNKE VISION APP, you can enjoy live video from every corner of the world. Check in on your home or business freely on your iOS/Andriod phone, tablet or PC, wherever you have an internet connection. Customizable Motion Zones & Instant Alerts Stay confident that you won't be bothered by false alerts, as you can mark out the motion detection zones. And instant email alerts with snapshots and APP alarm pushes allow you to take precautions in time. Multiple Recording/Playback Modes You can customize your cameras with different recording modes including manual, schedule and motion detection. Various playback modes like event, tag and smart mode, are also available. Notes: An internal hard disk drive is required; it can't record or playback without hard drive. 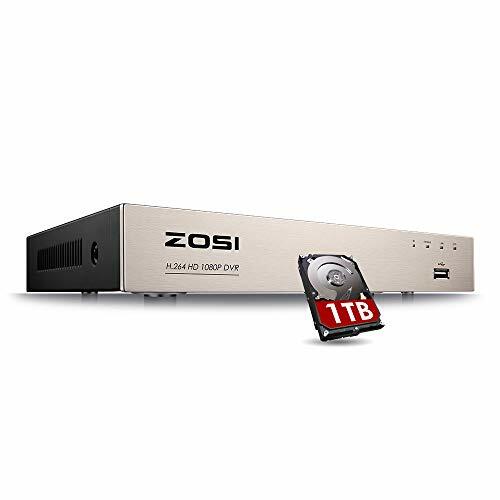 Please search ASIN ON AMAZON: B01G72GAOE for 1TB Surveillance Hard Drive Disk. The NVR UniFi Video Recorder from Ubiquiti Networks is a plug-and-play recording appliance for your UniFi Video cameras. 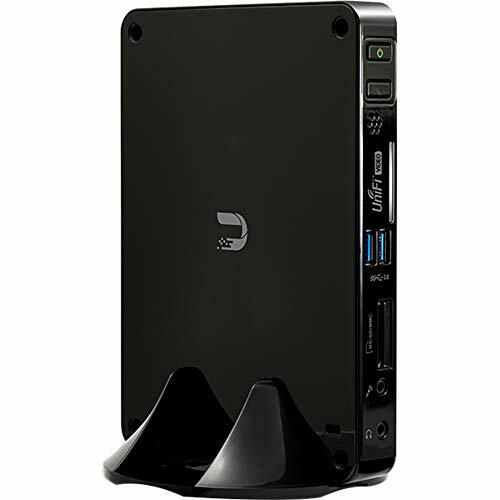 With a hard-drive capacity of 2 TB, this recorder quickly manages your UniFi Video cameras, records videos, and streams to the free cloud services with the web or mobile applications. You can record up to 700 hours of video at 1080p with options for full-time or motion-triggered recording. The UniFi NVR Video Recorder is pre-installed with UniFi Video software for quick and easy deployment. It manages the UniFi Video Cameras and records video according to rules set up in the software. The UniFi Video software features an advanced UI and extensive feature set, including custom motion detection zones, event recordings, email alerts, live view monitoring, disk management and analytics. This Video Recorder readily manages and records video from up to 20 cameras. The UniFi NVR Recorder features a setup wizard for easy configuration. Its pre-installed UniFi Video software automatically detects cameras for rapid deployment. (2). Local and Remote Access Anytime & Anywhere Easy to get live streaming or playback videos via free ZOSI App(ZOSI Smart or ZOSI View) on iOS & Android devices, through free ZOSI Client software on Windows or Mac,or via major browsers like Internet Explorer and Firefox. Please note:This system do not need the internet to operate. However, an internet connection will be necessary if you want to view remotely. (4). 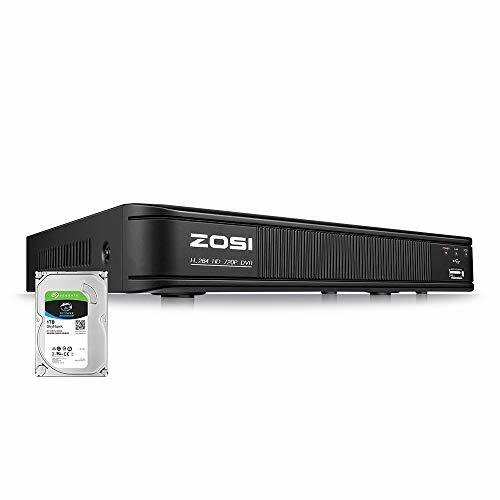 Customize Each Camera with Different Record Modes Our ZOSI DVR offers 4 kinds recording modes to meet your needs: Record footage continuously; Record during scheduled times; Only record when detect motion; Recycle record. You can customize each camera with different recording modes, which allows you to save space on the hard drive, and you can download the recording files for the USB backup. (5). Guaranteed Policy & Customer Support All systems CE & FCC certified with qualified power supplies.Guaranteed for 2 Years & Free life-time Tech Support. If our product stop working in the first year,we will replace it.////If you have any problems, please just feel free to email us or call us ,we will definitely respond you within 24 hours!!! (3). Advance Motion Detection & Alert Push You can customize motion detection area in each camera, reducing the number of unnecessary alarms, to save your time and allows you to stay connected to all the unexpected movements. The instant notifications and email alerts will be pushed to your phone directly as long as the cameras detect moving objects.Besides,you can block out select areas on each screen,this is to grant privacy in situations,people can not view of certain areas or activities. 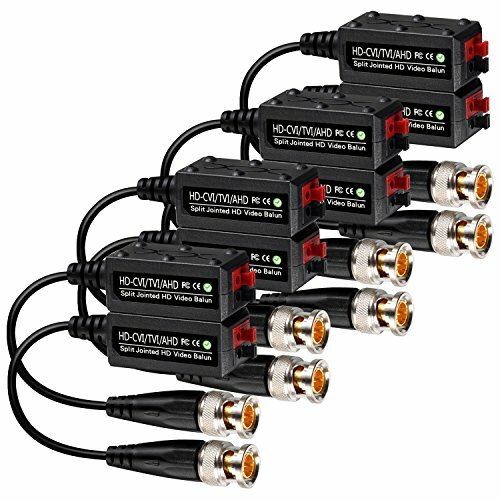 VIMVIP [Upgraded] 4 Pairs Mini CCTV BNC HD-CVI/TVI/AHD Passive Video Balun Transceiver used Innovative Split Jointed Design and Screw Free UTP Terminal Connecter, the newest generation video balun for you! 60dB cross talk and noise immunity. "Prees Fit" Terminal Blocks : Instead of screw installation on UPT terminal blocks, this upgraded VIMVIP Mini HD CCTV Via Twisted Video Balun Transceiver adopted newest " Prees Fit" screw free installation method, easy to install and save your time, makes the installation work more convenient! Innovative Split Jointed Design : There are 6 small holes and bulgy points set on opposite sides of video balun enable you to combine them together and made a neat line so they are more manageable if more than one video balun is used. Safety & Convenience : Got certificate of the FCC, CE and ROHS. Built-in transient suppression protection, lasts for over 10000 hours/417 days. In addition, a specification which has detailed installation steps make the procession of installation simple and convenient was attached. Widely Application : Support all HD-CVI, HD-TVI, HD-AHD, NTSC,PAL, and SECAM video formats. 60 Db cross talk and noise immunity. Push-terminal channel passive HD transceiver, male BNC allows connection directly to TVI/CVI/AHD or camera system gold plated BNC better transmission quality long distance HD transmitter. No power required! 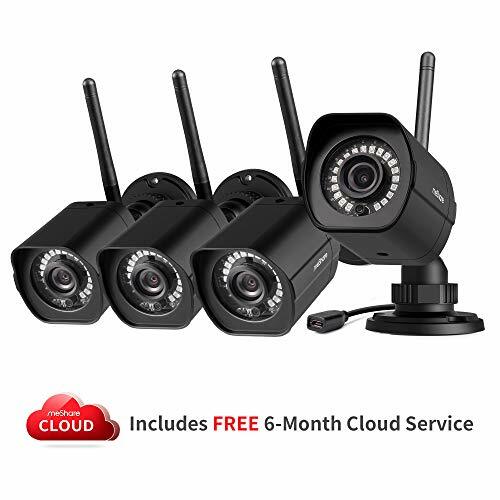 What you Get : 4 Pair VIMVIP [Upgraded] Mini HD CCTV Via Twisted HD-CVI/TVI/AHD Passive Video Balun Transceiver BNC Cable Screw Free UTP Terminal Connecter+Installation Specification+1 Year Friendly of Warranty Service. Extraordinary Quality: Supports 8-Channel 1080p/3MP/4MP/5MP Resolution. Records 8-Channels @ 1080p/3MP/4MP/5MP/6MP/8MP & Playback 8-Channel @ 1080p/4-Channel 3MP/4MP/3-Channel 5MP/2-Channel 6MP/2-Channel 8MP. Record in Widescreen, Quick Access QR Code Remote Viewing on iPhone, iPad, and Android (w/ included Amcrest View app). Advanced H.265 compression technology lets you save on storage space which allows for longer recording times. H.265 technology compresses your video without sacrificing any of the UltraHD video quality. Remotely Access Using Standard Windows and Mac Browsers. Easy to Install: Connect to and Manage All Cameras on Your Network. Feature-Rich OSD: Camera Name, Time, Motion Detection, Video Loss, Lock, and Record Status Icons. Multiple Trigger/Alarm Events: Recording, PTZ, Tour, Video Push, Email, FTP, and Buzzer. Custom Record Modes (e.g. Manual, Scheduled, Motion Detection) and Record Intervals (1-120min). ONVIF Compatible (Third Party Cameras limited compatibility). Supports up to 6TB Hard Drives (No Hard Drive Included). USB Backup Feature for Peace of Mind. 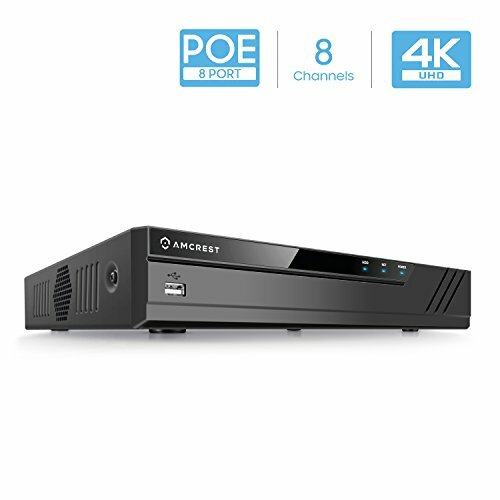 1 x Amcrest UltraHD 4K PoE NVR (NV4108E-HS). 1 x USB Mouse. 1 x Network Cable. 1 x NVR Power Supply. 1 x SATA Cables. User Manual, Quick Start Guide. 1 Year Warranty When Purchased from Amcrest. This NVR requires a hard-wired connection directly to your router to operate. Supports all Amcrest WiFi and Wired IP cameras and limited compatibility with third-party brand ONVIF compliant IP cameras. The system will only work with Amcrest cameras/systems and support POE cameras. Monitor needs to have HDMI compatibility and needs to be connected with HDMI directly into monitor, if not users could be experiencing monitor issues. 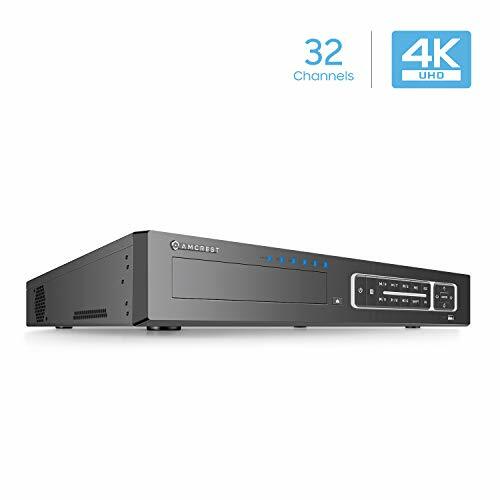 Amcrest's NV4108E-HS 8CH POE NVR supports hard drives up to 6 Terabytes, while Featuring 8CH Recording, Playback & Live View in Up to 8MP/4K Resolution @ Real-Time 30fps. Advanced H.265 compression technology lets you save on storage space which allows for longer recording times. H.265 technology compresses your video without sacrificing any of the UltraHD video quality. Intelligent search, playback, and backup functions provide enhanced ease of use and security (for example, motion detection event and exact search functions that are accurate to one second). Plug & Play setup, Easy to configure, access and control. Scan QR Code on POE NVR from Amcrest View app to instantly access live viewing and playback. Connects to and manages all the POE IP cameras on your network directly through their ethernet cables for ultimate ease and convenience in a home security system. Excellent Night Vision: Automatically switches to night vision mode for around-the-clock HD video coverage. Its lens with infrared LED light provides night vision up to 24.6ft. Extraordinary Quality: Supports 8-Channel 1080p/3MP/4MP/5MPResolution. Records 8-Channels @ 1080p/3MP/4MP/5MP/6MP/8MP & Playback 8-Channel @ 1080p/4-Channel 3MP/4MP/3-Channel 5MP/2-Channel 6MP/2-Channel 8MP. Record in Widescreen, Quick Access QR Code Remote Viewing on iPhone, iPad, and Android (w/ included Amcrest View app). Advanced H.265 compression technology lets you save on storage space which allows for longer recording times. H.265 technology compresses your video without sacrificing any of the UltraHD video quality. Remotely Access Using Standard Windows and Mac Browsers. Easy to Install: Connect to and Manage All Cameras on Your Network. Feature-Rich OSD: Camera Name, Time, Motion Detection, Video Loss, Lock, and Record Status Icons. Multiple Trigger/Alarm Events: Recording, PTZ, Tour, Video Push, Email, FTP, and Buzzer. Custom Record Modes (e.g. Manual, Scheduled, Motion Detection) and Record Intervals (1-120min). ONVIF Compatible (Third Party Cameras limited compatibility). Supports up to 6TB Hard Drives (No Hard Drive Included). 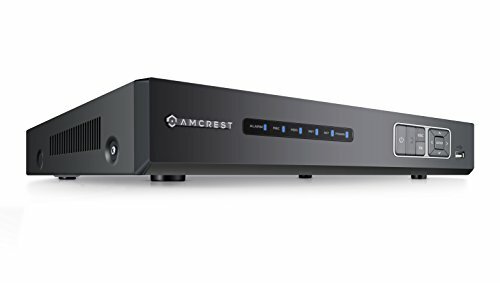 1 x Amcrest UltraHD 4K NVR (NV4108-HS). 1 x USB Mouse. 1 x Network Cable. 1 x NVR Power Supply. 1 x SATA Cable. User Manual, Quick Start Guide. 1 Year Warranty When Purchased from Amcrest. This NVR requires a hard-wired connection directly to your router to operate. Supports all Amcrest WiFi and Wired IP cameras and limited compatibility with third-party brand ONVIF compliant IP cameras. No PoE ports included with this model, does not provide Power Over Ethernet. Advanced H.265 compression technology lets you save on storage space which allows for longer recording times. H.265 technology compresses your video without sacrificing any of the UltraHD video quality. Quick and easy Plug & Play setup. Simply scan the QR Code on the NVR using the Amcrest View Pro app to instantly access live viewing, playback and other features. Connect and manage all of the Amcrest IP cameras on your network. Intelligent search, playback, and backup functions provide enhanced ease of use and security. Highly accurate Motion Detection alerts and search functions. Includes USB backup feature for peace of mind. Blazing throughput of 80Mbps allows you to watch UltraHD video footage in real-time without loss or delay. Conveniently packaged with extras such as a USB mouse, network cable, and quick start guide with user manual and CD. This NVR requires a hard-wired connection directly to your router to operate. Supports all Amcrest WiFi and Wired IP cameras and limited compatibility with third-party brand ONVIF compliant IP cameras. No PoE ports included with this model, does not provide Power Over Ethernet. All systems are CE & FCC certified with UL compliant power supplies. Includes 1-year US warranty & lifetime technical support from Amcrest. Support up to 32GB Micro SD card, 24-hour loop recording. Support PC computer monitoring, Smartphone multi-preview. install APP, scan UID code to add camera. 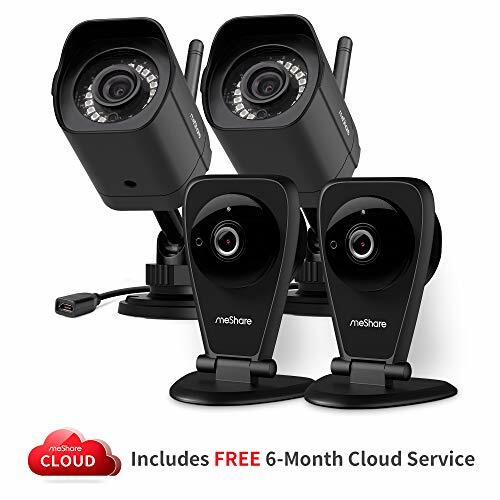 Free 6 Month Cloud Recording meShare cloud cam includes a 6 month, 7-day, intelligent continuous recording cloud service plan for free (Valued $75). Works with Alexa for voice control (Alexa device sold separately). Full Coverage Security Non-stop monitoring with 1080p HD provides a clear, sharp video both day and night. Two outdoor cams with weatherproof and two indoor cams with two-way audio allows you to keep wholly monitoring for your house. Easy Setup Use the QR code to scan and connect the meShare cloud cam, you can set up the security camera in a few minutes via the meShare app (Android or iOS). Advanced Cloud Service With the meShare cloud service, you will receive optimized algorithm alerts, 24/7 intelligent recording, Flashback and upcoming AI features. Warranty meShare offers a 30-day return policy and a 2-year limited warranty. Need help? Talk to a meShare technician with the Live Chat feature on the meShare app. Locks can be picked. Safes can be cracked. Seecuritty guards can make mistakes. No protection plan is ever completely foolproof. But with the proper monitoring plan, you will always have the truth. Criminal activity, and even accidents, often leave clues beforehand. With the right seecuritty and monitoring solutions, you have the ability to detect such risks. Detection is the first step on the path to prevention. And in case you don't prevent it, at least you will know what really happened. When things go wrong, the first question we ask ourselves is "why"? But often, other questions are more important. Forget motives. Our seecuritty cam will help you discover the who, what, when, where, and how. Empowered with this knowledge, you can go on to take appropriate action. If you need to recover damages, you always need proof. You want the most solid evidence possible. You want high quality video protecting your home, business, and any other property you have. 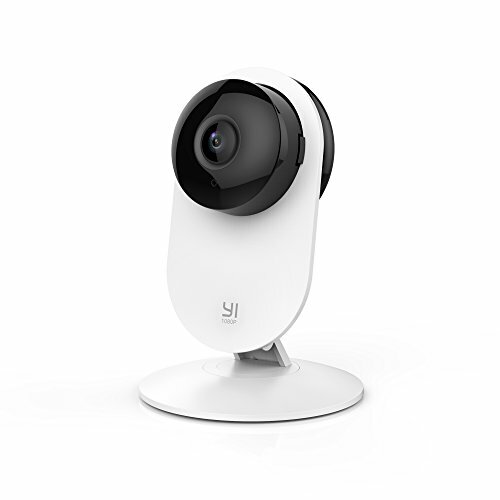 The MiniEye is the perfect camera system for your house, wireless and portable. Protect yourself before it is too late. You may regret not planning ahead. Before the break-in happens. Before the product disappears. Before disaster strikes. Before it's too late!  COVERTT CAM  Our mini camara will capture detailed digital video footage undetected.  HIGH DEFINITION  Our miniature cams record crystal clear HD footage so you won't miss any details.  MOTION DETECTION  The tiny concealed camcorder picks up movement to engage recording instantly. 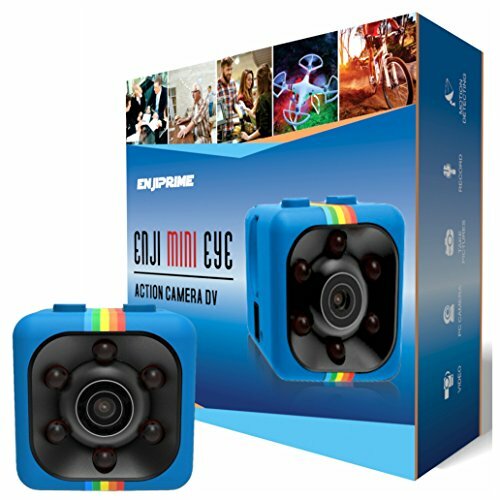  MULTIPLE USES  Use as a cop cam, nanny cam, body camera, sports action cam, or on a drone. *Not Wifi enabled. DVR FEATURES : View and Record in Widescreen with Remote Viewing on iPhone, iPad, and Android devices (with included Amcrest View Pro app). Supports Pentabrid AHD, TVI, CVI, 960H Analog and Amcrest IP Cameras (2CH). Supports up to 6TB Storage (Hard Drive NOT Included) for Continuous Recording at 4CH 1080n @30fps. Supports Long Distance Signal Transmission up to 984ft. Intelligent Video Footage Search and Playback. USB Backup Feature for Peace of Mind. DVR Dimensions: 10.25 x 9.25 x 1.8 in. DVR Weight: 1.9lbs. 1 x 1080n 4-Channel Pentabrid DVR (AMDVTENL4-H5). 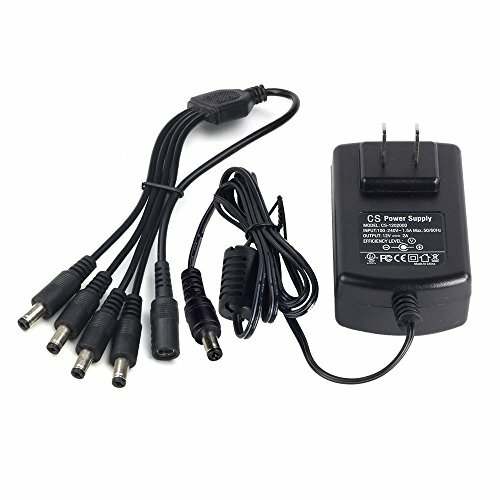 1 x DVR Power Adapter. 1 x Mouse. Quick Start Guide. 1 Year Warranty When Purchased from Amcrest. EXPERIENCE HD 1080N - The Amcrest 1080n surveillance DVR features uncompressed, latency free, point-to-point raw data, 1-Megapixel ProHD video transmission up to 1280 x 720P @ 30fps. Supports Live View 1080p and lower resolutions @ 30fps. Recording & Playback 1080n @ 30fps. VIEW FROM ANYWHERE - View ProHD footage from your video security system on your web browser using Internet Explorer as well as remote live viewing on iOS and Android devices using the Amcrest View Pro app. VERSATILE - This pentabrid DVR recorder supports analog cameras and Amcrest IP cameras with limited compatibility to third-party IP cameras. Supports HDCVI, AHD TVI, CVBS analog cameras. PLUG AND PLAY - This Amcrest DVR transmits video, audio, and controls over a single coaxial cable. Utilizes existing coaxial cable networks, reducing the need to run new cables to your Security System. H.265 Compression Technology allows for video files to be compressed without any noticeable difference in quality. Additional cameras can be purchased under ASIN: B01MQCGA4I. Extraordinary Quality: Supports 16-Channel 1080p/3MP/4MP/5MP/6MP/4K Resolution. Records 16-Channels @ 1080p/3MP/4MP/5MP/6MP/8MP & Playback 16-Channel @ 1080p/4-Channel 3MP/4MP/3-Channel 5MP/2-Channel 6MP/2-Channel 8MP. Record in Widescreen, Quick Access QR Code Remote Viewing on iPhone, iPad, and Android (w/ included Amcrest View app). Advanced H.265 compression technology lets you save on storage space which allows for longer recording times. H.265 technology compresses your video without sacrificing any of the UltraHD video quality. Remotely Access Using Standard Windows and Mac Browsers. Easy to Install: Connect to and Manage All Cameras on Your Network. Feature-Rich OSD: Camera Name, Time, Motion Detection, Video Loss, Lock, and Record Status Icons. Multiple Trigger/Alarm Events: Recording, PTZ, Tour, Video Push, Email, FTP, and Buzzer. Custom Record Modes (e.g. Manual, Scheduled, Motion Detection) and Record Intervals (1-120min). ONVIF Compatible. Supports up to 6TB Hard Drives (No Hard Drive Included). 1 x Amcrest UltraHD 4K 16CH NVR (NV4116-HS). 1 x USB Mouse. 1 x Network Cable. 1 x NVR Power Supply. 1 x SATA Cable. User Manual, Quick Start Guide. 1 Year Warranty When Purchased from Amcrest. 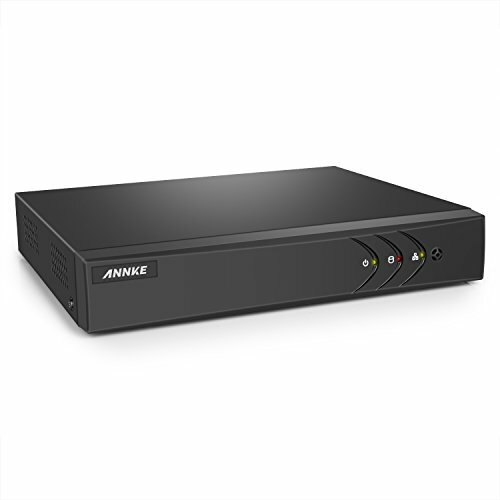 Amcrest's NV4116-HS NVR supports hard drives up to 6 Terabytes, while Featuring 16CH Recording (No Ports), Playback & Live View up to 4K Resolution @ Real-Time 30fps. Plug & Play setup, Easy to configure, access and control. Scan QR Code on NVR from Amcrest View app to instantly access live viewing and playback. Connects to and manages all the WiFi IP cameras on your network directly through their ethernet cables for ultimate ease and convenience in a home security system. Extraordinary Quality: Supports 32-Channel 1080p/3MP/4MP/5MP/6MP/4K Resolution. Records 32-Channels @ 1080p/3MP/4MP/5MP/6MP/8MP & Playback 32-Channel @ 1080p/4-Channel 3MP/4MP/3-Channel 5MP/2-Channel 6MP/2-Channel 8MP. Record in Widescreen, Quick Access QR Code Remote Viewing on iPhone, iPad, and Android (w/ included Amcrest View app). Advanced H.265 compression technology lets you save on storage space which allows for longer recording times. H.265 technology compresses your video without sacrificing any of the UltraHD video quality. Remotely Access Using Standard Windows and Mac Browsers. Easy to Install: Connect to and Manage All Cameras on Your Network. Feature-Rich OSD: Camera Name, Time, Motion Detection, Video Loss, Lock, and Record Status Icons. Multiple Trigger/Alarm Events: Recording, PTZ, Tour, Video Push, Email, FTP, and Buzzer. Custom Record Modes (e.g. Manual, Scheduled, Motion Detection) and Record Intervals (1-120min). ONVIF Compatible (Limited compatibility with third-party brand ONVIF compliant IP cameras). Supports up to 4 x 6TB Hard Drives (24TB) (No Hard Drive Included). 1 x Amcrest UltraHD 4K 32CH NVR (NV4432-HS). 1 x USB Mouse. 1 x Network Cable. 1 x NVR Power Supply. 2 x SATA Cable. User Manual, Quick Start Guide. 1 Year Warranty When Purchased from Amcrest. AC Input: 100~240V 50/60Hz can be used worldwide, DC Output: 12V 2A. This power adapter (transformer) is good for 12V CCTV 2A security camera (analog, AHD, IP). 1 to 4-Way Power Splitter enables you to easily power up to 4 security cameras. Simplifying the Installation Process. Simple installation, more safety. Quality warranty, Lifetime Tech Support. 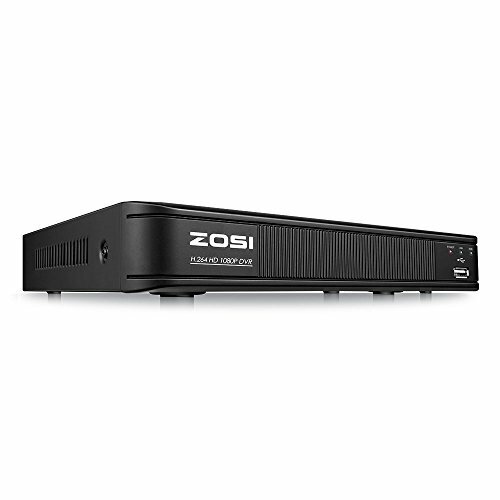 ZOSI 8 channels 1080P digital video recorder provides a complete security solution for your home and office network. Coming with H. 264 video compression technology. This DVR can remotely access from both internet or from your 3G/4G smart phones. This DVR is a hybrid dvr which can connect up to 4 or 8 analog camera 5. View your home on your phone anytime anywhere. video detection>continuous search mode: time/date, alarm, motion detection & exact search Video outputs: 1CH HDMI +1CH VGA +1CH BNC Video inputs: 8CH Audio inputs/outputs: 4CH/1CH alarm inputs/outputs: 4CH/1CH net interface: RJ-45 ptz control: support hard disk: 1 SATA ports(max 6TB) package contents 1 x 8CH full 1080P digital video recorder 1 x 12V/2000mA Power Supply for DVR 1 x mouse for DVR 1 x User Guide for DVR 1 x 2TB hard drivetroubleshooting steps1. Can not see image/ show" Video lost" On your monitor? This is caused by resolution compatibility issue. The default output resolution of the DVR is 1280*1024, which may not be compatible with some screens. Here is how to solve it: 1. Connect the DVR to any other screen via VGA, or you may also try any other screen computer LCD monitor is the best) via HDMI to see if you can enter the menu)2. When you are able to see the menu, click right button on mouse, go to DVR's main menu - setup - basic -video output to lower the resolution of your DVR. 3. Connect it back your primary screen via HDMI. You should have it worked with the screen. 2. What to do if the camera can not work when connecting to DVR? 1. The cable may be damaged, please change a cable to test it. 2. Power supply may has problem, please replace a new power Supply for it. 3. Please make sure DVR and cameras are in the same pattern. (Ahd/TVI/Analog). 4. Please make sure the format of DVR is the same as camera's: please go to your DVR main menu-sett up-basiccvideoe format (note: choose the same signal system as camera ). 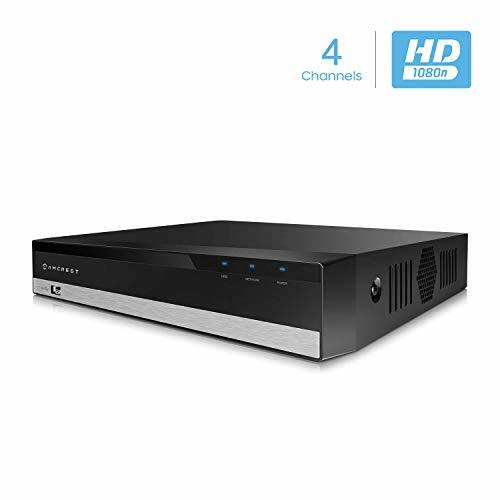 8CH 1080P 4-IN-1 HD-TVI DVR -- This 8 channel 4-in-1 DVR which supports Analog, HD-TVI, CVI ,AHD Camera. it provides you the flexibility to add 8pcs 720P or 1080P cameras. View from anywhere anytime -- The ZOSI Smart free app lets you see all of your cameras in one place. Check in on your home or business wherever you have an internet connection. Free ZOSI Smart App for Live View & Playback on Smart Devices with WiFi or 2G/3G/4G Anywhere Anytime.Smart Phone Support: iPhone, Android ,Ipad. Pre-installed a 2TB hard drive --This DVR is pre-installed a 2TB security hard drive. (But it will not come with cameras). DVR can be set to automatically overwrite the oldest internally stored footage or you can transfer those video files by USB to a memory stick or external hard drive. (2). local and remote access anytime & anywhere easy to get Live streaming or playback videos via free ZOSI app(zosi smart or ZOSI View) on iOS & Android devices, through free ZOSI Client software on windows or Mac, or via major browsers like Internet Explorer and Firefox. Please note: this system do not need the Internet to operate. However, an internet connection will be necessary if you want to view remotely. (3). 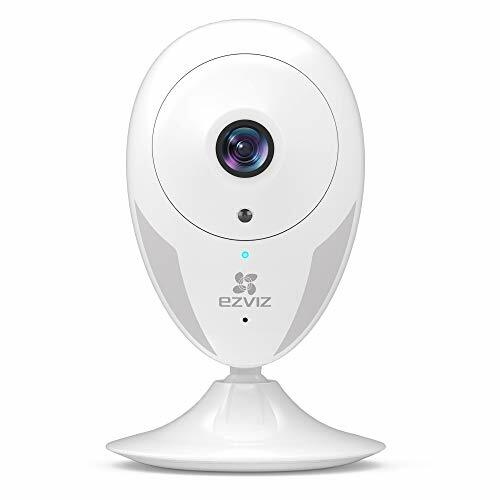 Advance motion detection & alert push you can customize motion detection area in each camera, reducing the number of unnecessary alarms, to save your time and allows you to stay connected to all the unexpected movements. The instant notifications and email alerts will be pushed to your phone directly as long as the cameras detect moving objects. Besides, you can block out select areas on each screen, This is to grant privacy in situations, people can not view of certain areas or activities. (5). policy & Customer Support All systems cu & FCC certified with qualified power supplies. for 2 years & free life-time tech Support. If our product stop working in the first year, we will replace it. ////if you have any problems, please just feel free to email us or call us, we will definitely respond you within 24 hours! ! ! Warranty: All systems CE & FCC certified with qualified power supplies.Guaranteed for 2 Years & Free life-time Tech Support. If our product stop working in the first year,we will replace it. This PoE NVR works with virtually any ONVIF compatible IP camera and after a quick and painless plug-and-play setup process, you can remotely watch things happen as they happen: real-time, highly reliable HD video without loss or delay, transmitted anywhere you have a wireless signal. A new cornerstone in the consumer market for private security technologies and an unsurpassed value with GW Security's 1 Year Warranty and Free Life Time Tech Support, each NVR is further enhanced by DIY installation and the plethora of features outlined below. Support Cloud Storage (Google Drive & Dropbox) / Cloud Upgrade with One-Click. 1 Year Warranty and Free Life Time Tech Support From U.S.A. Features: 1. Super Video Quality and Clarity: Supports 8-Channel 1080P Resolution 2. Multiple Trigger/Alarm Events: Recording, PTZ, Tour, Video Push, Email, FTP, and Buzzer 3. Custom Record Modes (e.g. Manual, Scheduled, Motion Detection) and Record Intervals (1-120min) 4. USB Backup. you can transfer video files to back-up media via USB port. 5. View Your Home on Your Phone anytime anywhere. 1. Can not see image/ show" video lost" on your monitor? This is caused by resolution compatibility issue. The default output resolution of the DVR is 1280*1024, which may not be compatible with some screens. Here is how to solve it: 1. Connect the DVR to any other screen via VGA,or you may also try any other screen computer LCD monitor is the best) via HDMI to see if you can enter the menu) 2. When you are able to see the menu, click right button on mouse, go to DVR's Main Menu - Setup - Basic -Video Output to lower the resolution of your DVR. 3. Connect it back your primary screen via HDMI. You should have it worked with the screen. 2. What to do if the camera can not work when connecting to DVR? 1.The cable may be damaged,please change a cable to test it. 2.Power supply may has problem ,please replace a new power supply for it. 3.Please make sure DVR and camers are in the same pattern.(AHD/TVI/Analog). 4.Please make sure the format of DVR is the same as camera's:Please go to your DVR s Main menu--Set up--Basic--Video Format (Note: Choose the same signal system as camera ). 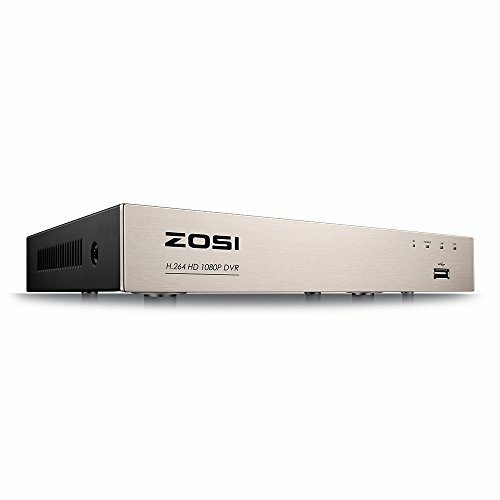 ZOSI 8Channel 4-in-1 DVR which supports analog, HD-TVI, CVI, AHD camera. It provides you the flexibility to extend additional cameras. You can add 8pcs 720P or 1080P cameras. Two year quality , life time Tech support ! if your product stops working in the first year we will replace it. Pre-installed 1TB hard Drive (expandable up to 4TB). longer recording times up to 30+ days Available with use of motion detection. Email notification & mobile push alerts when motion detection, free ZOSI View apps for live view and playback on smartphone devices under Wi-Fi/ 2G/ 3G/ 4G network. Two-year quality , life time Tech support! If your product stops working in the first year, we will replace it. 8Ch 1080P 4-in-1 HD-TVI DVR -- This 8 Channel 4-in-1 DVR which supports analog, HD-TVI, CVI, AHD camera. It provides you the flexibility to add 8pcs 720P or 1080P cameras. View from anywhere anytime -- The ZOSI Smart free app lets you see all of your cameras in one place. Check in on your home or business wherever you have an internet connection. Free ZOSI Smart app for live view & Playback on smart devices with Wi-Fi or 2G/3G/4G anywhere anytime. Smart phone support: iPhone, Android, iPad. Pre-installed a 1TB hard drive -thiss DVR is pre-installed a 1TB security hard Drive. (But it will not come with cameras). DVR can be set to automatically overwrite the oldest internally stored footage or you can transfer those video files by USB to a memory stick or external hard Drive. can be widely used in public, prosecutors, the armed police and other law enforcement departments. Q: How to change and customize the log-in password? A: Please go to: System Setting--Change PWD--Enter your own password. Q: After deleting all recorded files, camera still shows 'Capacity is full and do Not have space to record', how can i do? Windows device user: Simply right click the Card Reader, and choose to format. For Mac device user, go to 'Disk Utility' and find the Card Reader, then choose to Erase/ format. After formatting, new 64G memory capacity will be back for data saving. Reminder: To have your important data saved/ backed up before formatting, or it'll be deleted completely. 1) Considering the needs of law enforcement, all recorded files can be ONLY deleted on the computer via included USB cable. BUILT-IN DISPLAY: SMONET Body Worn Camera with 2 Inch LCD Monitor on which it Allows to Instantly Watch Back Previous Recording.On Screen Display Time,Date,Memory,Resolution,Battery Life and Recording Space Available Informing the User of exactly What's Going on. NIGHT VISION&WIDE ANGLE: Equipped with High-Intensity Infrared LEDs,You can Record Videos in Daytime,Also the Body Worn Camera can Capture Clear Footage Up to 30 Feet Away in Pitch Black Darkness.HD 1296P Recording and 140 Wide Angle Allow users to Get Footage Clearly and Widely. 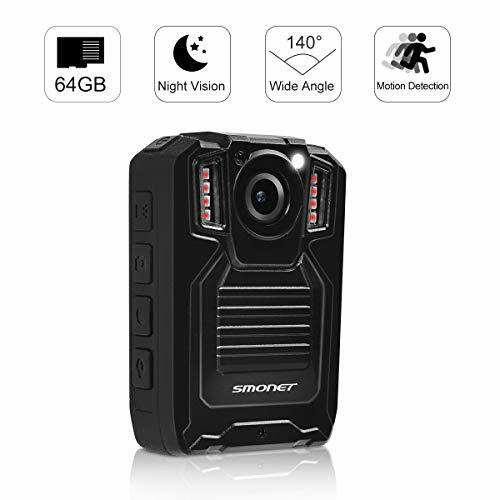 LONG BATTERY LIFE: Built in Rechargeable Battery (3000mAh),It Allows you to Capture over 10000 Images or Provide 8+Hours of Audio Recording on a Full Charge.SMONET Police Body Camera with IP67 Protection Grade Offer Great Water and Shock Resistance,Ideal for Indoor and Outdoor Use. MINI PORTABLE CAMERA: SMONET Body Worn Camera is extremely Tiny, Easy and Lightweight to be Carried Anywhere.Video Recording,Take Photos,Voice Recorder,Infrared Light All can be Achieved by this Multi-Function Item,As the Security Gadget,It's good choice for Security Guard,Police Officer and Bouncer.